Pensioner Leonard van der Berg had worked for a Cape Town brick making factory since he was a minor in 1956 until he was laid off in 2009. But now van der Berg 68, a father of four children and grandfather to six, is one of eight families that the company – Brick & Clay Cape in Frankdale near Vissershok landfill site – is evicting from eight houses the company initially built to provide accommodation to the workers so they could live close to the workplace. The company is now trying to evict the families from the three bedroomed houses they have lived in since 1988, and in which they have raised their children and grandchildren. But since the company handed an eviction notice to the residents in March ordering they vacate by December this year, they have vowed to not give up their homes without a fight. “We are going nowhere,” said Freddie Jantjies, 29. Jantjies’ father worked for Brick & Clay Cape for 32-years before getting retrenched in December last year, said the younger Jantjies. Van der Berg and Jantjies said although they haven’t been paying rent over the years, the company director Wayne Klaver would bill them over R2000 a month for household electricity usage. 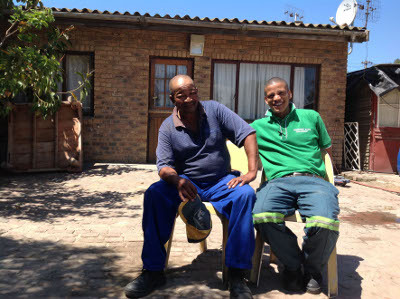 In September van der Berg was forced to pay R2341.85 for electricity he believes he didn’t use. It’s understood the brick factory uses electricity to dry the bricks and it was the residents who were footing the bill, said Jantjies. But with the eviction deadline looming the landlord disconnected the electricity supply at the end of October, say residents, and they have had to buy generators. “Some us have worked for the company for four decades now he is throwing us out of the houses like dogs,” said van der Berg. The residents approached the provincial Human Settlements Department but were told the issue was a private matter and thus the department could not intervene, said Jantjies. They had also received no help from the DA or ANC to whom they had turned. Attorney at the Legal Resource Centre, Steven Kahanovitz, said people could not be evicted without a court order. Kahanovitz said the courts would not easily grant an eviction order “unless there has been meaningful engagement between parties and alternatives have been discussed, and authorities will be more likely involved”. Meanwhile repeated efforts to get comment from the company have been unsuccessful.